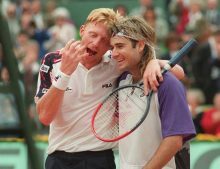 The former American World No.1 tennis player Andre Agassi struggled hard to beat the German Boris Becker, according to the article published in calvinayre.com by Lee Davy on January 19, 2017. After Becker had won the first three matches between the pair, Agassi realised he couldn’t handle Becker’s serve. The American and his coaching team plunged into the video replays and found a remarkable insight that swung the future matches heavily into Agassi’s favour. Video evidence revealed that just before tossing the ball, Becker would poke out his tongue. The way his tongue moved showed where the ball was going to be directed. Armed with this information, Agassi went on to win the next ten matches with Becker. Agassi said that the hardest thing was not to win every point on his serve. He believed that it was important to let the German win some of the points so he wouldn’t become aware of the fact that Agassi had found his tell. When you find out the weak points of your competitors, don’t push them too hard on those aspects of the business in the market so that you can ensure to profit from those weaknesses for a long time.